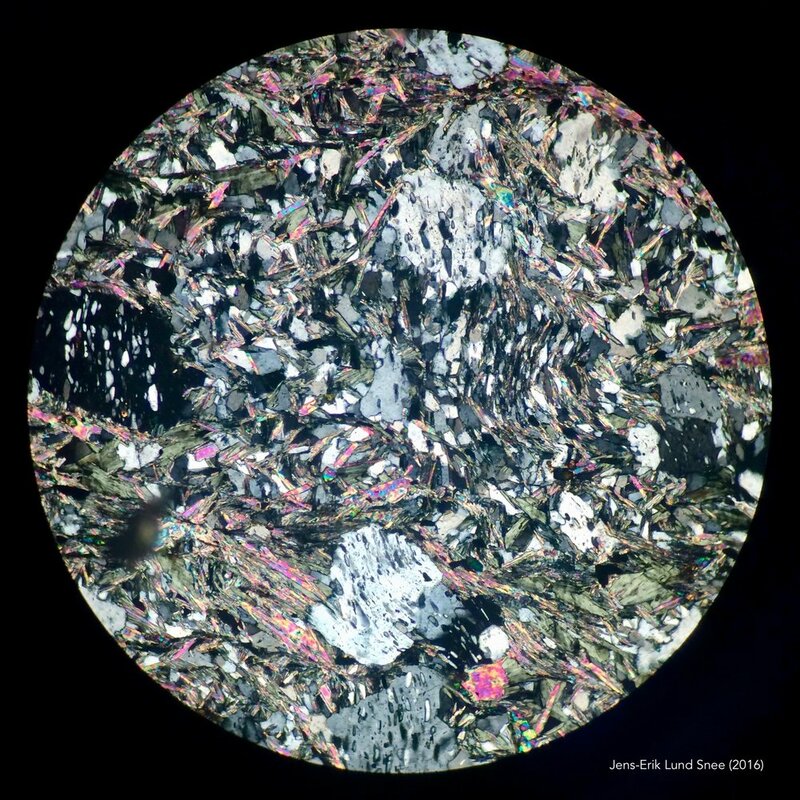 Chlorite–muscovite schist in thin section (XPL). Lund Snee, J.-E. and Miller, E. L. 2015. Preliminary geologic map of Cenozoic units of the central Robinson Mountain volcanic field and northwestern Huntington Valley, Elko County, Nevada. Nevada Bureau of Mines and Geology Open-File Report 15-2. 2 plates, scale 1:24,000, 42 p., http://pubs.nbmg.unr.edu/product-p/of2015-02.htm. Hennings, P. H., Lund Snee, J.-E., Osmond, J., Dommisse, R., DeShon, H. R., and Zoback, M. D. (submitted). Slip potential of faults in the Fort Worth Basin of north-central Texas, USA. Science Advances. Lund Snee, J.-E., Miller, E. L., Chamberlain, C. P., and Mulch, A. (submitted). Magmatism, migrating topography, and the onset of Basin and Range faulting. Lund Snee, J.-E. and Zoback, M.D. 2018. State of stress in the Permian Basin, Texas and New Mexico: Implications for induced seismicity. The Leading Edge 37(2): 127–134, doi:10.1190/tle37020127.1. Lund Snee, J.-E. and Zoback, M.D. 2016. State of stress in Texas: Implications for induced seismicity. Geophysical Research Letters 43:10,208–10,214, doi:10.1002/2016GL070974. Lund Snee, J.-E., Miller, E. L., Grove, M., and Hourigan, J. K. 2016. Cenozoic paleogeographic evolution of the Elko Basin and surrounding region, northeast Nevada. Geosphere 12(2), doi:10.1130/GES01198.1. Lund Snee, J.-E., Toy, V. G., and Gessner, K., 2014. Significance of brittle deformation in the footwall of the Alpine Fault, New Zealand: Smithy Creek Fault zone. Journal of Structural Geology 64: 79–98, doi:10.1016/j.jsg.2013.06.002. Moscati, R.J., Premo, W.R., Snee, L.W., Miggins, D.P., Bohannon, R.G., and Lund Snee, J.-E. (in preparation). Geochemistry and U-Pb and argon geochronology of select rocks from northeast Afghanistan. U.S. Geological Survey Scientific Investigations Report. Zoback, M. D. and Lund Snee, J.-E. 2018. Predicted and observed shear on pre-existing faults during hydraulic fracture stimulation. SEG Technical Program Expanded Abstracts: 3588-3592. Lund Snee, J.-E. and Zoback, M.D. Detailed new map of SHmax orientations and relative stress magnitudes in the south-central USA. World Stress Map Newsletter no. 2, Dec. 2017. Lund Snee, J.-E. and Zoback, M. D. A second-generation stress map of the intraplate USA, and its utilization for managing the hazard of injection-induced seismicity. Schatzalp Workshop on Induced Seismicity, Davos, Switzerland, 14 March 2019. Miller, Elizabeth L., Gottlieb, E. S., Hoiland, C. W., Konstantinou, A., Lund Snee, J.-E., and Ruksznis, A. Some problems and progress in understanding the evolution of metamorphic core complexes (MCCs) of the northern Basin and Range. Geological Society of America Cordilleran Section Meeting, Flagstaff, AZ, 16 May 2018. Hennings, P. H., Osmond, J., Lund Snee, J.-E., and Zoback, M. D. Slip potential of faults in the Fort Worth Basin. American Geophysical Union Fall Meeting, New Orleans, LA, paper S22B-05, December 2017. Lund Snee, J.-E., Zoback, M. D., and Walsh, F. R., III. Mapping relative principal stresses in the south-central United States with application to predicting fault slip potential. Schatzalp Workshop on Induced Seismicity, Davos, Switzerland, 16 March 2017. Zoback, M. D., Lund Snee, J.-E., and Walsh, F. R., III. Crustal stress coherency at multiple scales: Utilization for assessing potential fault slip in response to fluid injection. American Geophysical Union Fall Meeting invited poster, paper NS43A-1922, San Francisco, CA, 15 December 2016. Lund Snee, J.-E. and Zoback, M. D. Stress Map of Texas: Potential applications for triggered seismicity. Poster presented at the SPE/SEG Workshop: Injection Induced Seismicity—Engineering Integration, Evaluation and Mitigation in Fort Worth, TX, 28–30 March 2016. Lund Snee, J.-E., Miller, E. L., and Hourigan, J. K. 1:24,000 scale geologic mapping of Cenozoic units in Huntington Valley and the eastern Piñon Range, Elko County, Nevada. Poster presented at the Geological Society of America Annual Meeting in Denver, CO, 28 October 2013. Paper #146-10. Lund Snee, J.-E. and Miller, E. L. Geologic mapping, geochemistry, and detrital zircon geochronology in Huntington Valley and the eastern Piñon Range, northeast Nevada: Implications for the paleogeographic evolution of the Elko Basin and surroundings. Poster presented at the Geological Society of America Cordilleran Section meeting in Fresno, CA, 21 May 2013. Paper #27-3. Lund Snee, J.-E. and Toy, V. G. Characterization of faulted Australian Plate rocks and comparison with Alpine Fault rocks near Franz Josef, New Zealand. Poster presented at the A. F. Cooper & R. J. Norris Symposium, November 2011 in Dunedin, New Zealand. Lund Snee, J.-E. State of stress in intraplate USA: A second-generation map and its impact for induced seismicity and active tectonics. Invited Speaker: Special Seminar, ETH Zürich: Zürich, Switzerland, 1 March 2019. Lund Snee, J.-E., Miller, E. L., Chamberlain, C.P., and Mulch, A. Cenozoic thermal and topographic evolution of the northern Great Basin, western U.S. Invited Speaker: American Geophysical Union Fall Meeting: Washington, D.C., paper 394761, December 2018. Lund Snee, J.-E. State of stress in intraplate areas, USA: Induced seismicity and tectonics questions. Invited Speaker: U.S. Geological Survey Earthquake Science Center Seminar: Menlo Park, CA, 16 October 2018, watch at https://earthquake.usgs.gov/ contactus/menlo/seminars/1195. Lund Snee, J.-E. State of stress from the western Cordillera to the Eastern Seaboard, USA: Implications for induced seismicity. Invited Speaker: Berkeley Seismology Laboratory Seminar, University of California, Berkeley: Berkeley, CA, 26 October 2018. Lund Snee, J.-E. and Zoback, M. D. New stress maps of the central and eastern USA and induced seismicity in the Permian Basin. Invited Speaker: Noble Energy: Houston, TX, 1 September 2018. Lund Snee, J.-E. and Zoback, M. D. New stress maps of the central and eastern USA: Utility for managing injection-induced seismicity. Invited Speaker: American Rock Mechanics Association Induced Seismicity Workshop: Seattle, WA, 17 June 2018. Lund Snee, J.-E. Implications of new stress mapping for oil and gas production in tight formations. Invited speaker: Society of Petroleum Engineers Gulf Coast Section Geomechanics Congress: Recent Advancements in Petroleum Geomechanics: Spring, TX, 18 April 2018. Lund Snee, J.-E. and Zoback, M. D. Detailed mapping of stress orientation and relative magnitude in the Permian Basin and implications for fault slip potential. Invited speaker: American Association of Petroleum Geologists Southwest Section Convention: El Paso, TX, 9 April 2018. Lund Snee, J.-E. and Zoback, M.D. State of stress in the Permian Basin: Utility for predicting fault slip potential. Invited speaker:MicroSeismic, Inc. User Forum: Houston, TX, 1 February 2018. Lund Snee, J.-E., Zoback, M.D., and Walsh, F.R., III. State of stress in Texas & Oklahoma: Implications for induced seismicity and oil & gas production. Invited speaker: Tuesday Technology Talks, Apache Corporation, Houston, TX, 14 February 2017. Lund Snee, J.-E. and Miller, E.L. Geologic mapping to as a modern tool to understand the Cenozoic extensional history of the northern Basin and Range Province, Nevada. Invited speaker: “The William Smith Map at Stanford: Bicentennial Celebration”: Stanford University Branner Earth Sciences Library, March 2015. Lund Snee, J.-E., Miller, E.L., and Hourigan, J.K. Cenozoic volcanism, faulting, and basin development in the eastern Piñon Range and central Huntington Valley, Elko County, Nevada. Invited speaker: May 2015 Geological Society of Nevada meeting: Reno, NV. Lund Snee, J.-E. and Zoback, M. D. Preliminary next-generation stress map of the central and eastern USA. American Geophysical Union Fall Meeting: Washington, D.C., paper 349127, December 2018. Lund Snee, J.-E., Miller, E. L., and Chamberlain, C. P. Rise and fall of the Great Basin from Late Cretaceous through Cenozoic time. Stanford University Tectonics-Geochronology-Petrology Seminar: Stanford, CA, 5 December 2018. Zoback, M. D., and Lund Snee, J.-E. Predicted and observed shear on pre-existing faults during hydraulic fracture stimulation, Society of Exploration Geophysicists Annual Meeting: Anaheim, CA, 17 October 2018. Lund Snee, J.-E. and Zoback, M. D. Updated stress maps in unconventional basins: Utility for managing induced seismicity. May 2018 Stanford Center for Induced & Triggered Seismicity semi-annual meeting: Stanford, CA, 4 May 2018. Lund Snee, J.-E. and Zoback, M. D. Stress mapping and fault slip potential in the Permian Basin, west Texas and southeast New Mexico. Invited speaker: Earthquake Engineering Research Institute (EERI) Seminar, Stanford University, 9 March 2018. Lund Snee, J.-E. and Zoback, M. D. State of stress in the Permian Basin, Texas and New Mexico: Implications for the potential of induced seismicity. SEG/SPE Injection-Induced Seismicity Workshop—Intersection of Evolving Science and Regulation, Dallas, TX, 6 November 2017. Lund Snee, J.-E. and Zoback, M. D. State of stress in Texas: Implications for induced seismicity. October 2016 Los Alamos National Laboratory State of Stress in the Earth conference, Santa Fe, NM. Lund Snee, J.-E. and Zoback, M. D. Stress Map of Texas: Latest results and work in progress. May 2016 Stanford Center for Induced & Triggered Seismicity semi-annual meeting, Stanford, CA. Lund Snee, J.-E. and Zoback, M. D. Initial results from the new Stress Map of Texas project. American Geophysical Union Fall Meeting, San Francisco, CA, paper S21C-04, December 2015. Lund Snee, J.-E. Predicting overpressure using basin and petroluem system modeling software. Invited speaker: November 2015 Stanford Basin & Petroleum System Modeling Affiliates Meeting, Stanford, CA. Lund Snee, J.-E. and Zoback, M. D. Preliminary results from the new Stress Map of Texas project. October 2015 Stanford Center for Induced & Triggered Seismicity semi-annual meeting, Stanford, CA. Lund Snee, J.-E. and Zoback, M. D. Launching the new Texas Stress Map project. June 2015 Stanford Rock & Borehole Geophysics Project annual meeting, Menlo Park, CA. Chair, Induced Seismicity technical sub-theme; Co-Chair, Induced Seismicity session, American Association of Petroleum Geologists (AAPG) Annual Conference and Expo, San Antonio, Texas, 2018–2019. Organizer and white paper contributor: Sustainability in the Hydrocarbon Value Chain, Mexican Institute of Petroleum (IMP) international workshop, Mexico City, 2017–2018.